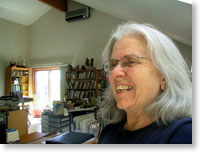 Judith Panson was born in England and has lived in Canada since 1965. She graduated in art from Plymouth and London Universities and has taught art at all levels from elementary through college as well as working at various art related positions including design studio, pottery studio, department store window dressing, free lance illustrating for greeting cards, a cook book publisher and nineteen books for Blueberry Hill Publishers. Her work has been in gallery, solo and group shows in various parts of Canada, and in Mexico, New Zealand and the U.S.A. She has won awards in juried shows in both Manitoba and Ontario for water media, printmaking and fibre hangings. Her work hangs in both corporate and private collections in Australia, Canada, England, Mexico, Switzerland and the United States of America.